How to turn old, crystalized honey into beautiful, clear honey. Clear honey after one trip through the dishwasher. Sometimes I find a great deal on honey and buy more than I can use. After a few years, I look though the pantry and discover that I have half a bottle of awful, old honey with big grainy crystals in it. Until now, all it was good for was ruining breakfast. Now I found the solution! If the old honey is in a plastic jar, cut the top right off with a knife or scissors. 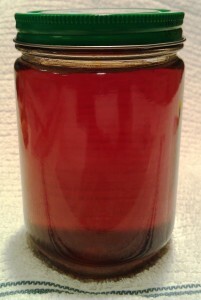 Using a sturdy spoon, scrape out all the old honey into a clean glass jar with a tight fitting lid. I used a peanut butter jar. Make sure the top of the jar rim and lid are both clean and undamaged and screw the lid on tight. Put the jar in the dishwasher. The next time you run the dishwasher, let it complete it’s cycle normally, then leave it overnight without opening the door. That’s it! You now have a beautiful, clear jar of honey! Honey is mostly sugar. Over time, the sugar crystallizes and forms lumps. The hot water in the dishwasher returns the crystals back into solution, and the long, slow cool-off period prevents the crystals from re-forming. You never have to throw out old honey again!